Road Trail Run: Review Salming Distance 3: Low, Wide, Light, and Fast. A Well Balanced Do It All Racer Trainer. 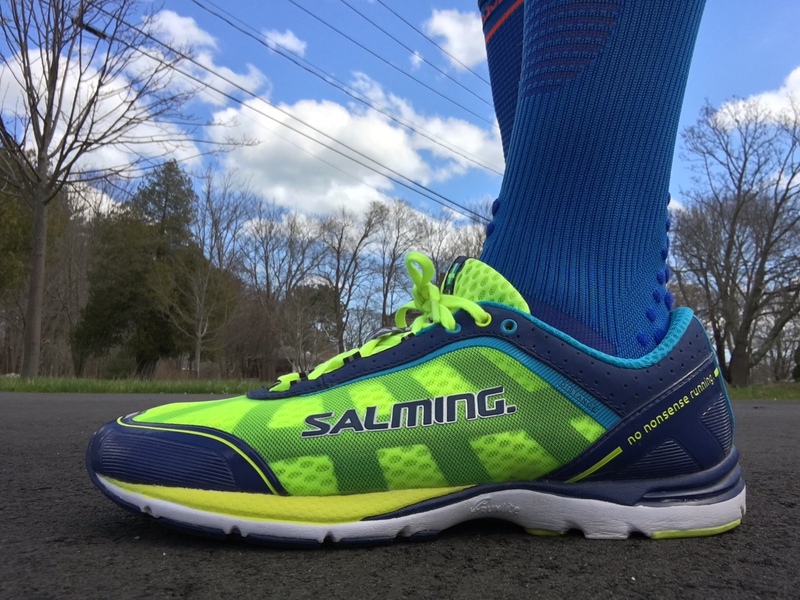 Review Salming Distance 3: Low, Wide, Light, and Fast. A Well Balanced Do It All Racer Trainer. The Salming Distance 3 is a "stabilized" neutral trainer racer with 22mm heel 17mm forefoot, 5mm drop according to Running Warehouse EU stats. My size 9 US weighs 8 oz/227 grams, Women's size 8 weighs 7.2 oz/204 g. Retail $155. Never heard of Salming? 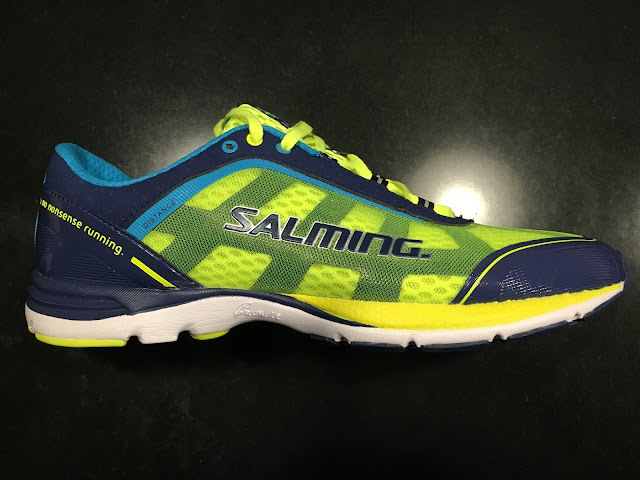 Well Salming is a Swedish company that started in squash shoes and the last few years has moved rapidly into running with a great line of shoes. Their designs are practical. "No Nonsense" is Salming's slogan but this is by no means a stripped down or for that matter budget shoe! Very well balanced between responsiveness, light weight, and cushion, the Distance is one of those rare shoes that can be a single arrow in the quiver for both training and racing. It is a very successful update to their earlier Distance. Low as the contrasting colors of the midsole further trick the eye into thinking this is a lower shoe than it actually is. Despite the very well cushioned, relatively high and responsive stack of RunLite High Abrasion EVA, the look is sleek and low slung with a tapering toe box which unlike so many low toe boxes is perfectly comfortable, and far more comfortable due to its softer less extensive and higher toe bumper than the last year's Distance. Road feel is excellent without being harsh. Light as at 8 oz this is a lot of durable well cushioned shoe for the weight. The rubber coverage is extensive with blown rubber up front and real rubber at the heel. Fast and Easy as the new midsole is among the most responsive, yet also easiest legs, of any of the lighter racer trainers I have tested this year. A big improvement over the earlier Distance whose ride was somewhat harsh and unforgiving. The new injection molded RunLite midsole is some fabulous secret blend, sitting somewhere for me between Boost and traditional EVA with lots of firmly directed pop with no harshness and is a big improvement with ride over the Distance 1's earlier RunLite. Other shoe lines using injection molding instead of the more conventional compression molding include among others: Skechers 5Gen models, Nike Lunar models, Hoka Speedgoat and Infinite. An injection molded midsole translates for me into a smoother compression and energy return of the foam with less of a sensation of bottoming out without return of energy. Stable with a Smooth Transition and Toe Off. The Distance has this design and marketing mouthful: TGS 62/75 design. What does this all that stuff mean and does it work? The rear 62% of the shoe is designed with extra stability from a mid foot Torsion Efficiency Unit, a TPU winged stability plate similar to adios Boost Torsion System with in the case of Salming less plastic on the lateral side and an end to the plastic at Salming's "ballet line", short of Adios's long plastic fingers which extend further forward. The 75 stands for the fancily named "ballet line, a 75 degree angled transition wherein the front the shoe is more flexible for more natural propulsion. The "line" is just in front of the white triangle in the photo above. The shoe flexes slightly later and further forward on the medial side than on the lateral side up front in a smooth arc with less pronounced toe spring than the Adios. It works. I can absolutely feel my foot moving from stance to a toe off towards the medial side. It's a subtle and unique sensation. If you prefer to keep your shoe collection "light", The Distance 3 can serve as a light durable trainer with responsive if firmer cushioning. It can also be a fine racer. The ride is very smooth, stable, and consistent with a marvelous transition to toe off from the ballet line. The update in cushioning feel, less harsh and firm from Salming's earlier Distance, is noticeable and welcome as is the wider fit and less of and softer toe bumper. Given the 17mm of forefoot cushion, wide forefoot, and stability, I would certainly consider them as my half or marathon shoe in addition to an every day trainer for faster days at any distance. The price at $155 is up there but this is a high quality beautifully made shoe that should also be durable. Runners with wider feet will likely find the Distance 3 a good fit in a faster run and race shoe. Highly Recommended. Very similar shoes in design and weight. The Adios forefoot is snappier with more toe spring but less cushion. The Distance heel is a touch firmer. Both versatile and durable for training and racing. I give the Distance a slight nod for additional versatility, the Adios for shorter race distance performance. The Distance is more agile and flexible with similar levels of stack. The Kinvara is more cushioned in the heel and slightly more stable in large part to its snugger narrower upper. Kinvara at $110 is considerably less than Distance at $155 but you should get more miles out of Distance with its fuller coverage rubber. The Tracer is firmer and stiffer, a rougher faster ride, shorter race only for most while the Distance can do double duty. Tracer is 1 ounce lighter. While the Distance upper is fantastic, the Tracer's race fit is among the best of the lighter 2016 shoes we have tested but wider feet may prefer the distance. Clayton at the same weight is more cushioned with 3mm more forefoot cushion and 2mm more heel cushion. The ride is softer and a bit less agile than Distance. Clayton is more suitable for longer runs and as with Distance can be a single arrow in the quiver shoe understanding the soft RMAT outsole will tend to wear faster than Distance's rubber. Distance 3 to New Balance Zante 2 (Peter Stuart's Score 4.9 review). For those who found the Zante a bit constraining the Distance should provide more room and is 0.7 oz lighter. They have almost identical stacks with Zante 2 having 1mm more in the heel. I prefer the flexibility and smoothness of Distance's more segmented outsole. Peter loved the Zante 2 update's additional upper room and slightly firmer ride. I only ran in v1. The Salming Distance was provided at no charge to Road Trail Run. The opinions herein are entirely the author's.